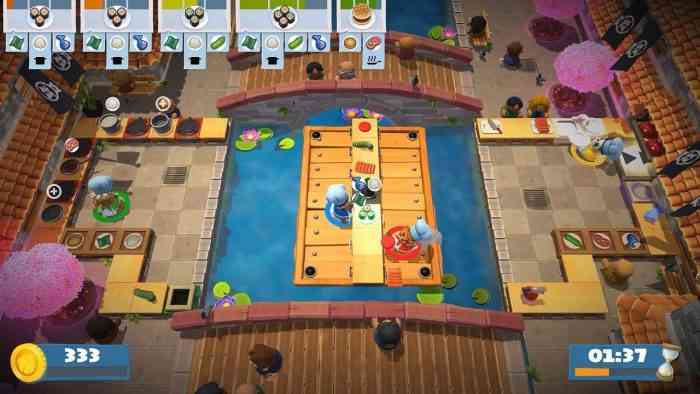 In August, the Overcooked 2 developers revealed that an upcoming update will add a New Game Plus mode to the mix designed to kick the challenge up a notch. That update has now begun rolling out, but Ghost Town Games has also dropped a nice surprise. In addition to a fourth-star high score challenge added to every level, a new DLC package called Surf ‘n’ Turf is now available for download. It’s an all-new culinary adventure set on a bright tropical island with 12 new campaign levels, new recipes to whip up (kebabs and smoothies), new kitchens, and three more chefs to choose from too. There’s also a new water pistol item that may have some mystery uses. Hmmm. – New Levels! Surf ‘n’ Turf features 12 new story levels. Explore the island from the pool to the beach, just watch out for waves and…. conga lines?! Once you’ve completed the Surf ‘n’ Turf DLC, a New Game Plus option will also be available. The update didn’t just add a new mode and support for DLC, it also allows players to switch chefs on the world map. This was a slight criticism we had with the game in our review. The patch also irons out a handful of bugs and glitches. Surf ‘n’ Turf should be available on all platforms starting today. It cost £4.49 / €4.99 / $5.99. Let us know what you think about the new DLC in the comments below.